A fourteenth-century knight, with couched lance, is charging at a quintain. But stay - what is this? He rides a wooden horse with wooden wheels and is being pulled along by a couple of chums. You might have seen something similar only a year or two ago before computer-games and 'paedeatricians' stopped kids playing in the street. That little scene, pictured in a medieval manuscript, encapsulates much of what Orme has to tell us in this thought-provoking and beautifully illustrated study. 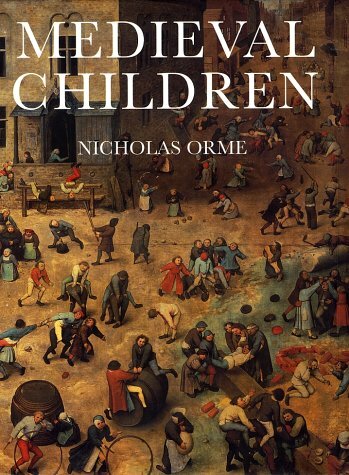 As an historian he has undertaken much research into education and society in the middle ages and he sets out here to confront what has become Received Wisdom: that, in those far-off times, there was no concept of 'childhood' such as we have today, and that children were regarded as not much more than 'inadequate adults'. Dr Orme's method of procedure in demolishing this view is of the simplest. In nine chapters covering aspects of life over five hundred years or so ('Arriving' ... 'Family Life' ... 'Danger and Death' ... etc.) he presents an array of evidence, drawn from a tremendous spread of sources, to show how the province Childhood was not only acknowledged but could also be respected by our ancestors. Obviously the length and the depredations of elapsed time result in the evidence arriving promiscuously from different periods and places; obviously too Dr Orme has to apologize for his sources' frequent silence on subjects like females and the labouring classes, but all that does not interfere with his large and wholly convincing argument. Although the book is barbarically designed (the diligent reader is forever flipping backwards and forwards to get at the references, their attendant bibliography, and the sources of illustrations) the text has the momentum of a cumulative anthology, and readers of BfK should take especial pleasure in the chapters on 'Words, Rhymes and Songs', 'Play', 'Learning to Read', and 'Reading for Pleasure'. Anent which hearken to the following example from a French grammer of 1530: 'He hath been at school this half year, and yet he cannot spell his Paternoster.' Plus ?a change.